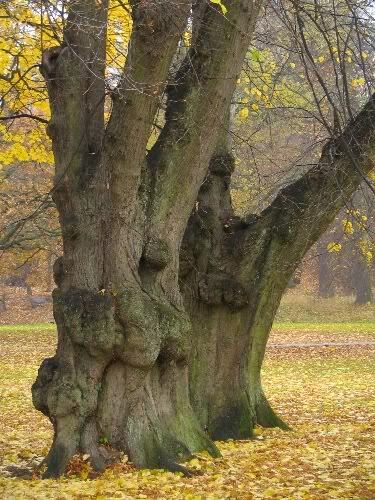 Haga Park, a beautiful park in the northern part of Stockholm, created in an "English Park" style. 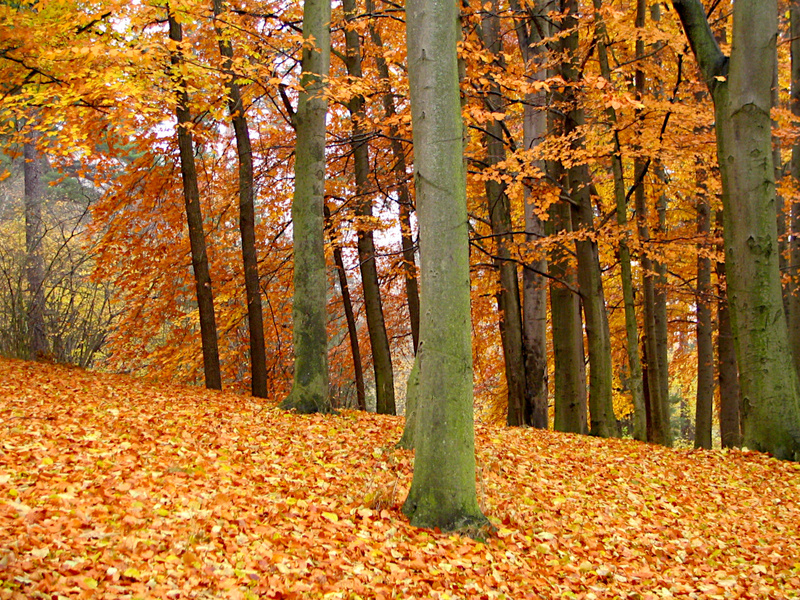 I was here on a rainy autumn day, but even on a day like this the park managed to charm me. I loved strolling around here, enjoying the nature with its wonderful fall colours and the unusual but interesting buildings and monuments. I must have walked around here for over 2 hours and I still wasn't tired of this place. 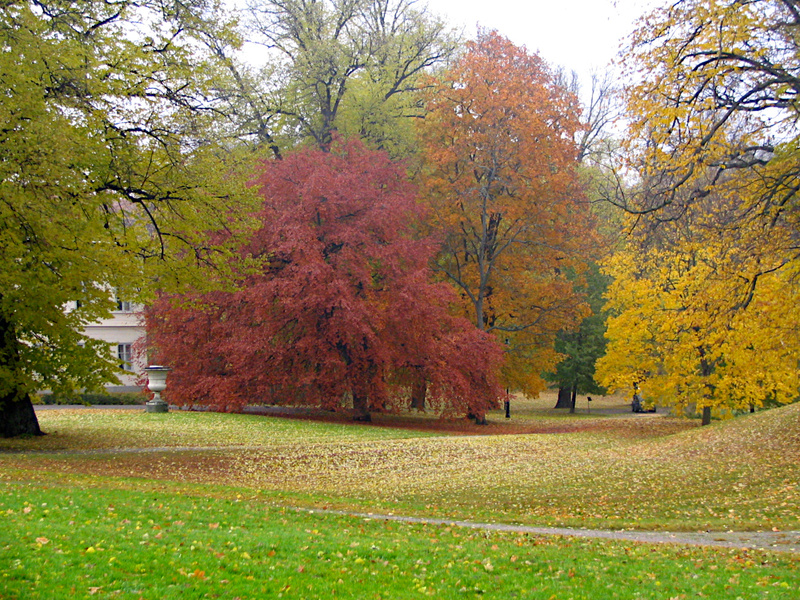 Haga Park is located outside the north tollgate of Stockholm and was bought by Gustav III in 1771. Beside the obvious beautiful park landscape of the park you can also see and visit some interesting places. I made a little map for you where you can easily locate the places I will be talking about on this page. 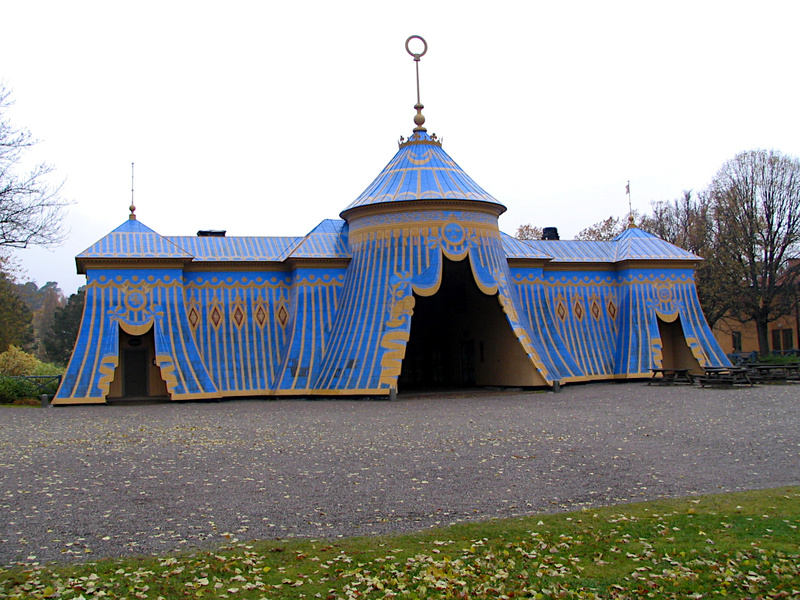 Visit for example the striking "Copper tent houses" / "Koppartälten" that is home to the Haga Park Museum. Also worth a visit are the "Butterfly house" / "Fjärilshuset", "Gustav III's Pavilion" and the "Queen's Pavilion" or also called "Haga Slott". 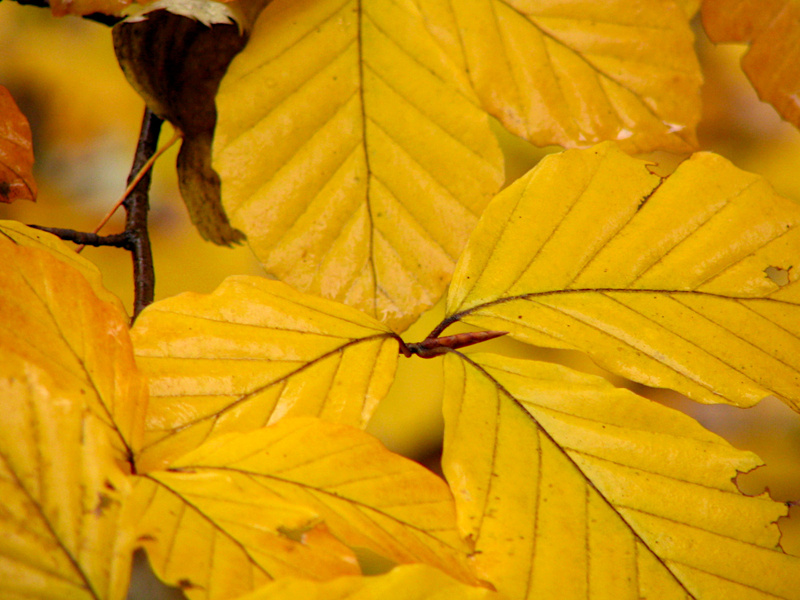 But keep your eyes open because there is much more to see in the park! 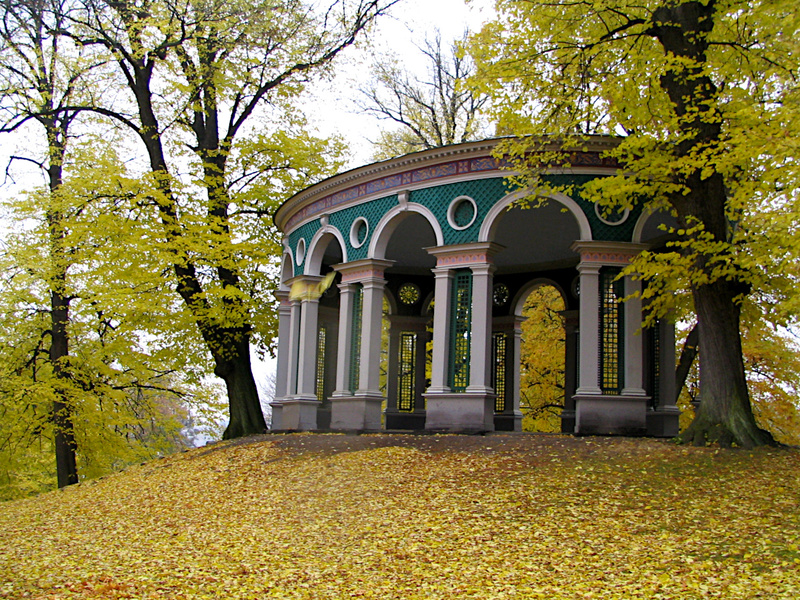 During my walk in the park I also visited the "Temple of the Echo" / "Ekotemplet", "Prins Gustaf's Monument" and the "Chinese Pavilion". Okay, so far my introduction to Haga Park. Now it is time to explore and show you why I like this place so much. So why don't you follow me around on my stroll through the park? Let's start at the North Entrance. Very close to the parking lot I saw this sign that stirred up my curiosity. Here I realized how big this area really is. If I had wanted to, I could have walked for hours and hours, as this is not just 'one' park, but a there are lots of green areas attached to each other which create one huge green area. 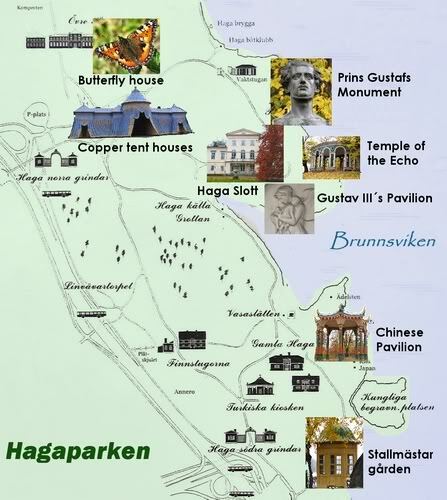 As you can see on the sign, Haga Park is part of the "Nationalstadsparken Ulriksdal-Haga", but that is not all. Together with Ulriksdal, Brunnsviken and Djurgården it forms the "Ekoparken" / "The Eco Park", which is the world's first National City Park. The "Eco Park" was established in 1995. I saw this place in one of my travelbooks and was fascinated by it. Who would build a Copper Tent house in the middle of a park?? Enough said, I had to see this for myself. 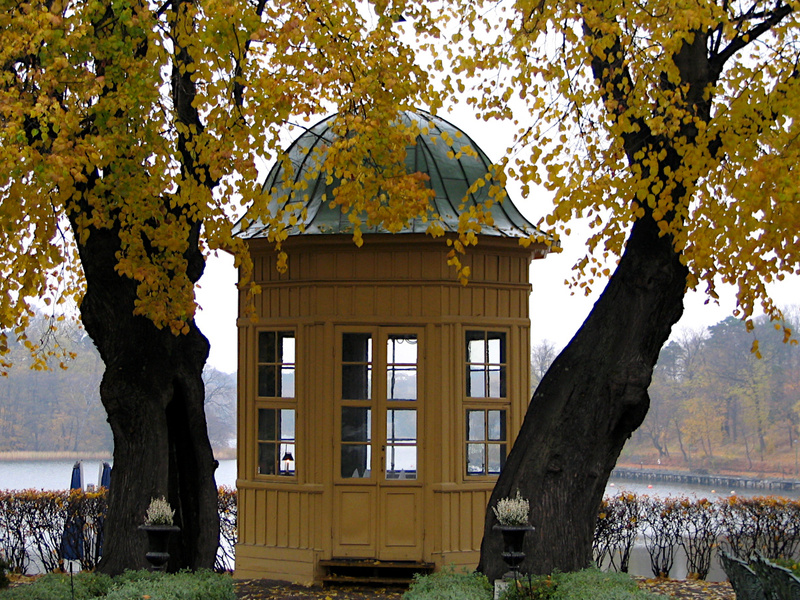 So that's why I am here, in Haga Park on this autumn day, standing in front of the copper tent, hahaha, and still not knowing why someone would build a place like this! It looks so strange, but fun at the same time. To my surprise there wasn't only one of these buildings, but three in a row! To understand this park a bit better and especially the buildings you can see here, I mabye should tell you a bit more about its founder: King Gustav III. also called the theatre king. 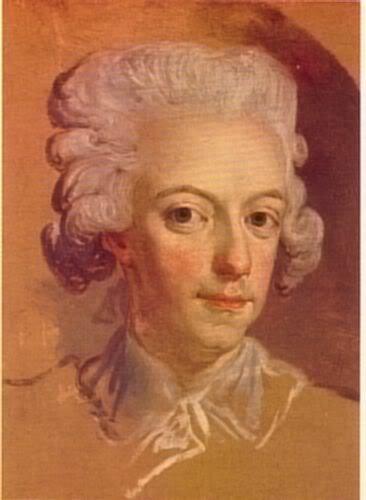 Gustav III (1746-1792) became king in 1771. After one year on the throne he made, with support of France, a coup d'tat to increase his power. He ruled despite his dictatorship in the name of "enlighten autocracy" and carried through many reforms. The most important was freedom of religion and the ban of torture. He also changed the law so that the number of crimes with the death penalty was decreased. He was assassinated by a group of people, when he was participating in a "Masquerade" at the Opera. The group was lead by Johan Anckarström who shot the king with a pistol. The king was hated by the nobility because of his reduction of their privileges and they were the "sponsor" of the murder. Gustav III died 13 days later from his wounds. 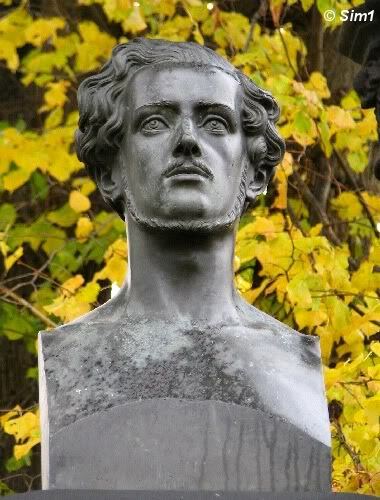 Anckarström was beheaded one month later, the other in the group expelled from the country. 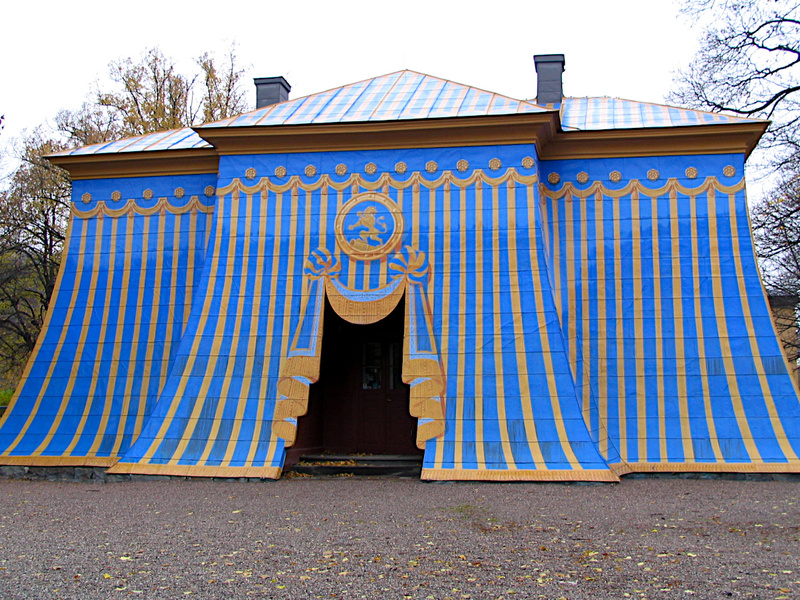 Knowing now about Gustav III, the theatre king, these Copper Tents do make a bit more sense. They certainly have this dramatic and theaterical look to them that fits to his love for the theatre. The tents were originally built in 1787 as lodgings for the guard of King Gustav III. The design of the Copper Tents was by by Louis Jean Desprez and he tried to create the illusions of a sultan's encampment on the edge of the forest. The tent facades all face the main lawns, making the dramatic effect of them even stronger. Unfortunately the buildings burned down in a fire in 1953, but the tents were rebuilt in 1962-1964 (facades) and the rest of the buildings in 1977. Now these three unusual building house the Haga Park Museum (middle), a restaurant (right) and a accomodation to the park office (left). These copper tents are now a national monument. I would have loved to take a look inside, but due to my unusual timing (an early morning in autumn), the museum and the restaurant weren't yet open for the day. The butterfly garden is 800 square metres in size and has a tropical environment, which means very moist and warm. 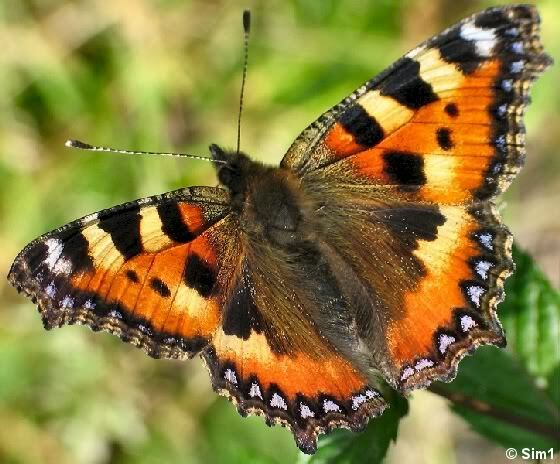 At any given time there will be about 400 butterflies flying freely around of numerous different species. The butterflies are exotic for Europe, but are quite common in their natural environments. In the photo you can see a not so exotic butterfly, hahaha, but one that is very common in my backgarden and this particular one was kind enough to sit still for a little while, so Åke could take a photo of it. A short stroll from the Butterfly house and the Kopper Tents I came across the Monument of Prins Gustaf. 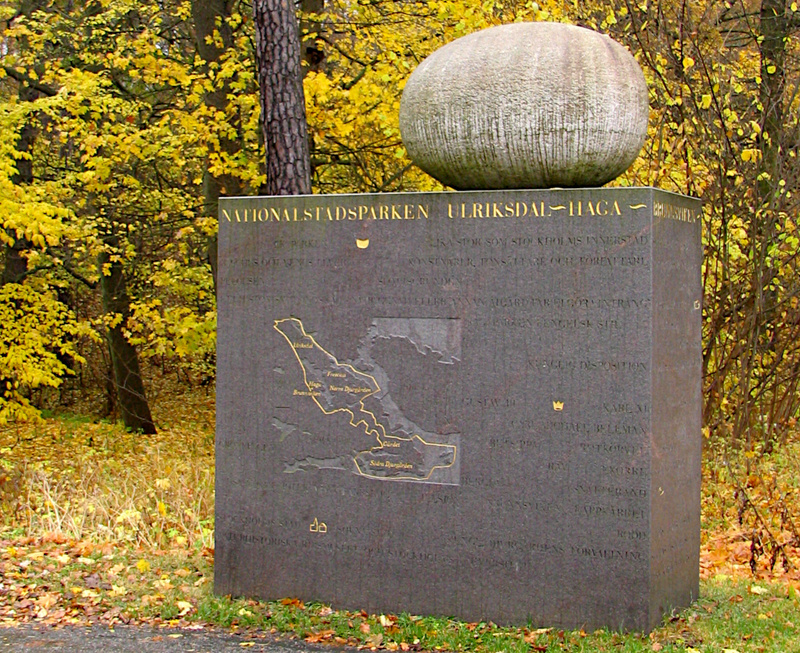 The monument is placed on top of a little hill close to the waters of "Brunnsviken" hidden under some trees. 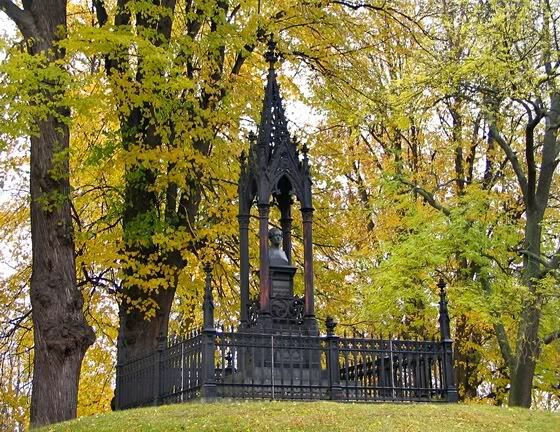 The monument of Prins Gustaf was placed here in 1854. Prins Gustaf was son of King OscarI and Josepfina and part of the Bernadotte dynasty. 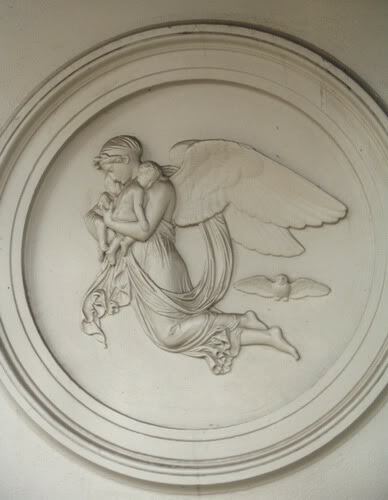 He died when he was 25 years old (1827-1852) and lived for his music. That's why he is also known as the "Sångarprinsen" (Singing prins). The monument to the prins is quite charming and certainly worth the little climb up the hill to take a closer look. I followed the waterside for a little while and started to see a few more people in the park, jogging, walking, and all enjoying the park in their own way. And in the distance I could see Haga Slott or also called the "Queen's Pavilion". The "Queen's Pavilion" was built in 1802-1804 by Gustav IV Adolf, and has been used as a royal residence during several periods. The house was designed by Christoffer Gjörwell and is in Italian Villa style. For me the house didn't look that impressive, but it is nicely surrounded by some beautiful autumn coloured trees, giving it some charm. 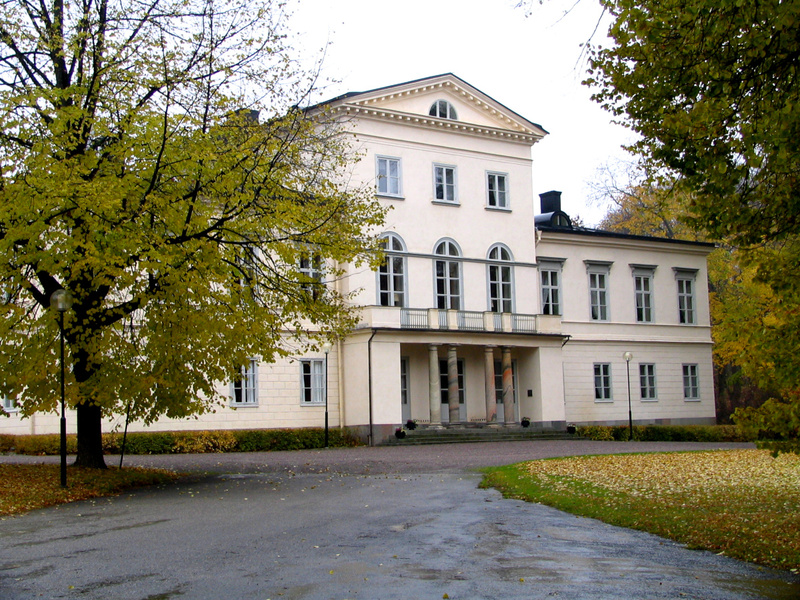 Today Haga Slott is used by the Swedish government as an accommodation for prestigious guests. Gustav III's Pavilion was furnished after a trip that the king made to Italy and many of the original furnishings are still here. Especially the The "Spegelsalen" or Hall of Mirrors is particularly worth seeing. 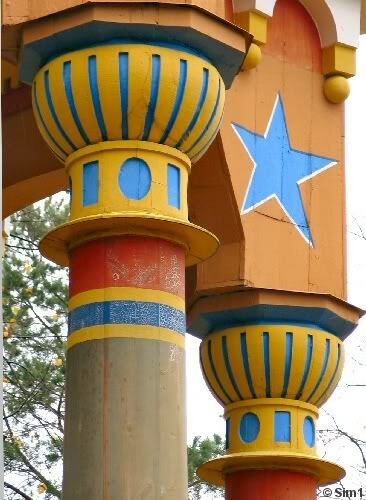 The Pavilion was designed by architect Olof Tempelman and decorated by Louis Masreliez in Pompeiian style. I think this was one of the favourite places in the park during my visit: The Ekotemplet (the Temple of the Echo). Hahaha, it also might have helped that is just started to rain lots more and this was the excellent place to take some cover. The views from the Ekotemplet are lovely, but so is the structure itself. Ekotemplet was built in the 1790s as Gustav III's summer dining hall. The Temple has an oval shape and has 12 pillars, which hold up the copper roof. The roof is constructed in a very special way making it possible to overhear everything that is said inside it. So not the best place to start whispering secrets during one of the royal gatherings and parties of that time! I didn't notice any of the special acoustics of the temple as I was here all by myself, hahaha, so it was very quiet inside, but I did enjoy the views through the 12 pillars. The pillars, shape like arches, just framed the park landscape in a wonderful way, creating some beautiful views, as you can see in the photo. The Temple itself just fits in perfectly in the landscape, positioned on top of a little hill, surrounded by trees. Maybe one of the more disappointing places for me was the Chinese Pavilion. I was looking so much forward to see this structure and imagined these bright colours against a nice blue sky.... instead it was raindrops falling from the sky. The Chinese Pavilion is located on the south-eastern part of the park, close to the Royal Graveyard and on top of a steep hill. There isn't much there and the views aren't as great either compared to the other places. The colours are still striking of the pavilion and I can imagine taking some nice photos on a sunny day. But on a dull day like this it is no real use to climb all the way up here. 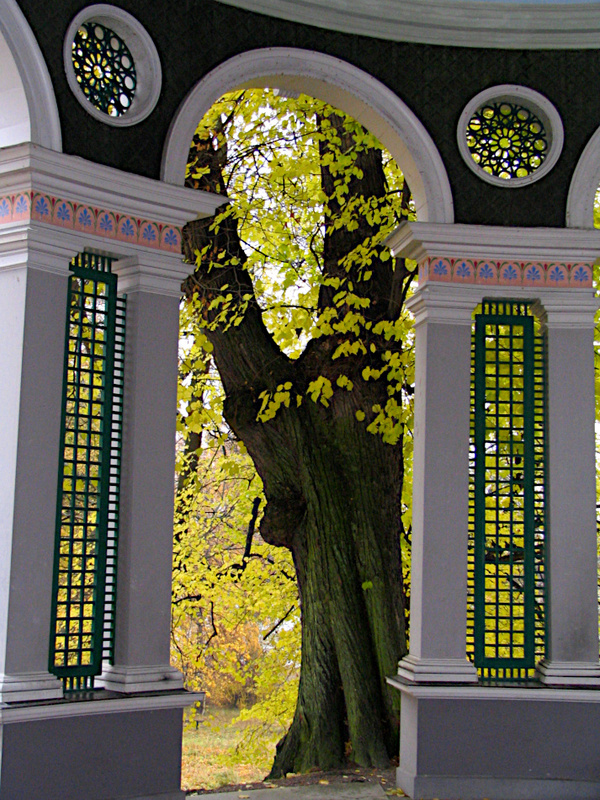 The Chinese Pavilion, or "Kinesiksa pagoden" in Swedish, was designed by Desprez in 1787. 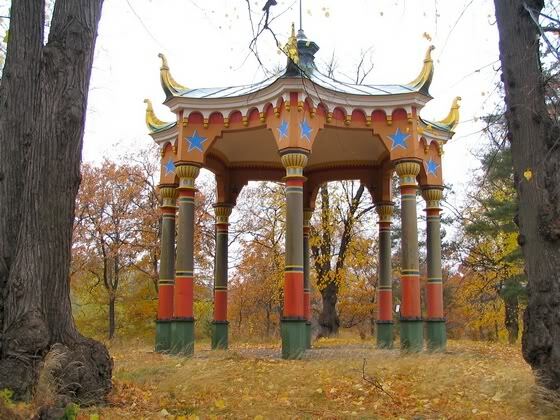 There was a strong interest in everything Chinese in the late 18th century in Sweden, so it was quite logical for those times to include a Chinese Pavilion in the design of the park. Well, maybe this is not such a good idea on a rainy autumn day like I had, hahaha, but on a beautiful summer day this would just be perfect. I know I'll be back here, on a dreamy summerday as I described above, taking my picnic basket with me and thinking back to the tip I wrote here. But even on a non-perfect day like today, with the grey sky and a drizzle of rain, it felt perfect to me :-) The falling leaves, the autumn colours, the quiet surroundings, the smiles on the faces of the people I passed, yes, this park has character and charm and seems to be loved by many. Stallmästaregården is Stockholm's oldest still excising inn and is idyllically situated on the shore of Lake Brunnsviken, just south of Haga Park. The history of this inn dates back to 1645 and it is one of Sweden's most well known restaurants, so that's why I just had to mention it on this page. Many famous Swedish chefs began their careers here. They are known for their own smokehouse and the kitchen is inspired by the traditional Swedish cuisine with a mix of a slightly more modern cooking. I had a look at their menu list and I most say I was very tempted to go in. Unfortunately it wasn't dinner time and I am not sure if my credit card would be so happy with a visit here, hahaha, as prices aren't that cheap. But if that isn't the issue I think this could be a wonderful restaurant to visit on your trip to Stockholm. I guess you read the page and are now enthousiastic in going here. So here is quick description how to find the park. Hagaparken is located on the north side of Stockholm, about 4 kilometres from the city centre. Take the underground to Odenplan. From Odenplan take the bus 515 (weekdays also bus 70) to Haga Norra (North entrance of the park). You kan also take the local train to Solna and then the bus 515. Alternatively you can take the underground to St.Eriksplan and walk towards "Norrtull". From here it is only a short distance to the South Entrance of the park. If you go by car you need to take road E4 towards Arlanda (Uppsala) and take exit Haga Norra / Hagaparken.